Dr. Saal got a Diploma and PhD in Physical Chemistry from the Technical University of Darmstadt. After starting his industrial career at Siemens, he joined Merck KGaA in 1999 where he worked in the central analytical department and in medicinal chemistry. His research interests focus on analytical characterization of new chemical entities including physico-chemical characterization of research compounds and development candidates. Dr. Saal has a teaching assignment for pharmaceutical technology at the Johann-Wolfgang Goethe University. 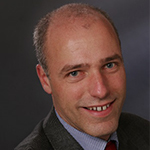 He is a member of several expert groups on analytical methods at the European Directorate for the Quality of Medicines. S. Paulekuhn, J. Dressman, C. Saal: „Trends in Active Pharmaceutical Ingredient Salt Selection based on Analysis of the Orange Book Database“, J. Med. Chem., 2007, 50(26), 6665-6672. B. Hoellke, M. Arlt, C. Saal, „Comparison of Nephelometric, UV-Spectroscopic and HPLC Methods for High-Throughput Determination of Aqueous Drug Solubility in Microtiter Plates“, Analytical Chemistry, 2009, 81(8), 3165-3172. E. Widjaja, P. Kanaujia, G. Lau, W.-K. Ng, M. Garland, C. Saal, A. Hanefeld, M. Fischbach, M. Maio, B.H. Reginald, “Detection of trace crystallinity in an amorphous system using Raman microscopy and chemometric analyses”, European Journal of Pharmaceutical Sciences, 2011, 42(1-2), 45-54. P. Kanaujjia, G. Lau, W.K. Ng, E. Widjaja, M. Schreyer, A. Hanefeld, M. Fischbach, C. Saal, M. Maio, R.B.H. Tan, “Investigating the effect of moisture protection on solid-state stability and dissolution of fenofibrate and ketoconazole solid dispersions using PXRD, HSDSC and Raman microscopy”, Drug Developm. Ind. Pharm. 2011, 37(9), 1026-1035. A. Petereit, C. Saal, “Optimizing Solubility: Kinetic versus Thermodynamic Solubility – Temptations and Risks” Eur. J. Pharm. Sci., 2012, 47(3), 589-595. C. Saal, A. Becker, “Pharmaceutical Salts: A Review on Doses of Salt Formers form the Orange Book”, Eur. J. Pharm. Sci., 2013, 49(4), 614-623. S. Paulekuhn, J.B. Dressmann, C. Saal, „Salt Screening and Characterization for poorly soluble, weak basic Compounds: Case Study Albendazole”, Die Pharmazie, 2013, 68, 555-564. E. Hoppe, H.P. Buchstaller, H.M. Eggenweiler, C. Sirrenberg, A. Zimmermann, J. Maerz, H.Schwartz, C. Saal, M. Meyring, S. Hecht, “A novel strategy for ADME screening of prodrugs: Combined use of serum and hepatocytes to integrate bioactivation and clearance, and predict exposure to both active and prodrug to the systemic circulation”, J. Pharm. Sci, 2014, 103(5), 1504-1514. C. Saal, A. Mieden, A. Marx, M. Vogtherr, “Investigation of solubilising effects of bile salts on an active pharmaceutical ingredient with unusual pH dependent solubility by NMR spectroscopy”, Eur. J. Pharm. Biopharm, 2015, 92, 32-41. C. Saal, M. Lange, C. Kühn, H. Untenecker, A. Jonczyk, S. Petersen, G. Scholz, V. Buback, M. Dotzauer, H. Bauer, J. Förster, J. Schumacher, A. Metz, M. Schmidt, K. Seemann, „Cilengitide – Exceptional Pseudo-polymorphism of a Cyclic-Pentapeptide”, Eur. J. Pharm. Sci., 2015, 71, 1-11.